The USGS provides a continuous source of streamflow information that is used in countless ways by governmental organizations, private industries, and the general public. Serving as the largest hydrologic data holder in the world, the information provides the scientific basis for decision-making related to protection of life and property from water-related hazards, such as floods, and management of freshwater that is safe and available for many uses. Emergency managers often have urgent needs for situational awareness, impact assessment, and management of recovery or mitigation activities. Collecting and delivering information where and when it is needed requires advanced planning. The USGS can monitor water conditions anywhere, but we must have the equipment in place before the event. The resources listed here are available by partnering with USGS. The USGS can provide technical assistance for flow statistics, flood frequency calculations, emergency flow measurements, monitoring and sampling of chemical spills, time of travel, characterization of floods, forensic determination of flow dynamics, and discharge at ungaged locations. Click the green "FLOOD RESOURCES" button above for additional flood resources from the U.S. Geological Survey. 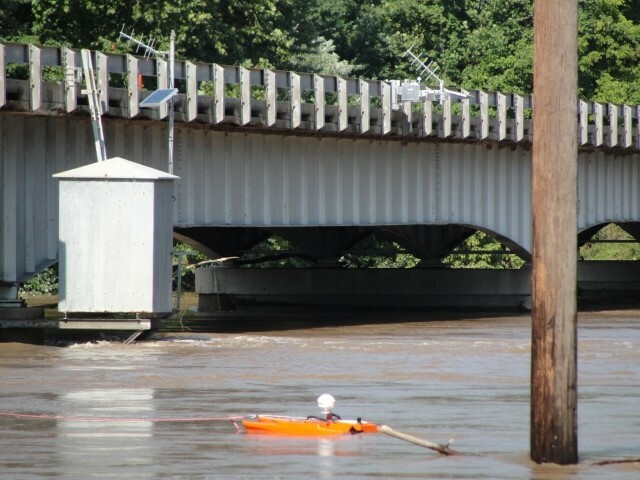 The USGS collects and distributes real-time streamflow data for over 8,100 streamgages that support local decision making and National Weather Service river forecast capabilities. 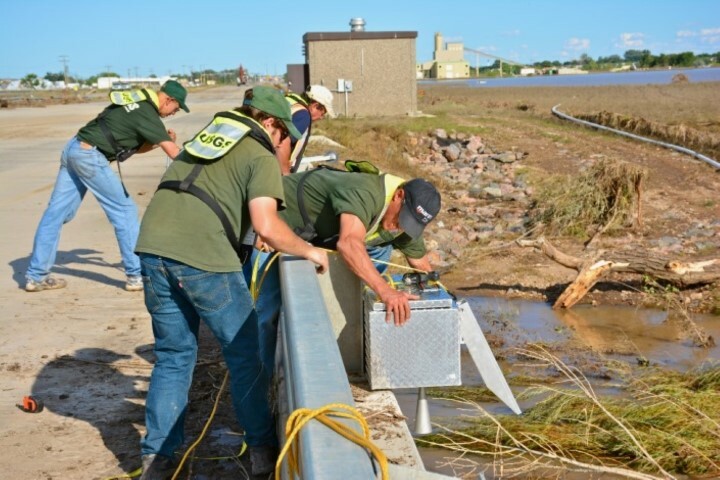 During major floods, we deploy field crews to measure flood flows and water quality at streamgages and other locations of interest (such as breached levees, chemical spills, etc.). Where no streamgage already exists, a rapid-gage can be deployed before the permanent gage can be installed (see below). During an emergency, you may not have a streamgage where you need one. The needs may include flood control reservoir operation, flood forecasting, flood fight operations, road closure, and emergency management, including evacuations. To meet this need, USGS developed, built, and maintains a cache of rapid-deployment streamgages (RDGs) that can be installed to collect and transmit near real-time stage data, often within hours of a recognized need. They can be installed quickly and with minimal impacts to bridges and structures. Data for RDGs are also available at http://waterdata.usgs.gov and alerts are available through http://water.usgs.gov/wateralert/ when they are operational. 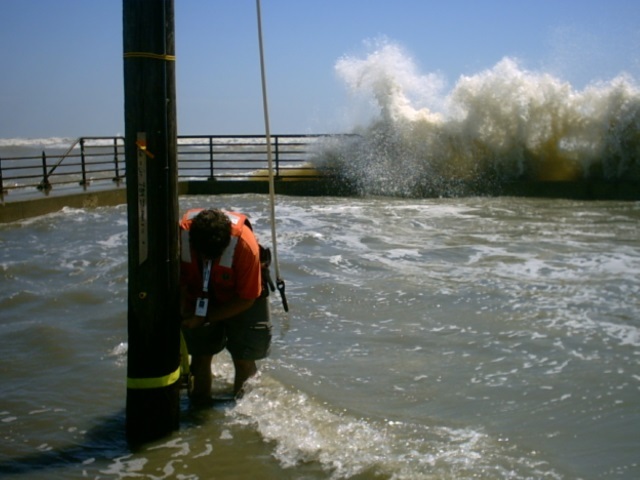 If additional data is needed for calibration of models or documenting flood peaks, we can install small water-level and temperature sensors in extensive, temporary networks that provide dozens to hundreds of observation sites along a river or coast line. These have been widely used to document storm-tide flooding. More information is available at http://water.usgs.gov/floods/. 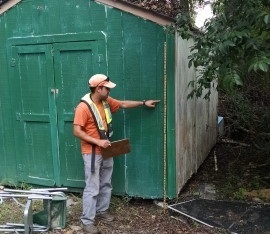 If the flood peak was not documented by other sensors or inundation mapping is desired, the USGS marks, surveys and stores HWMs in a national database. These studies are not completed for every flood, but where the communities and other agencies gather to support the flood documentation effort. For more information on any of the water monitoring methods listed here, contact your local Water Science Center by clicking a state in the map at left, or visit (http://water.usgs.gov). Contact the USGS National Flood Coordinator, Robert R. Holmes at bholmes@usgs.gov.